Objectives : The aim of present study is to analyze the intermediate and long-term follow up results of percutaneous closure of fossa ovalis atrial septal defect (ASD) with Amplatzer septal occluder (ASO) in a large cohort of patients including children and adults. Methods : Between May 1998 and July 2008, 529 patients (age group 2-77 years, median 28 years) underwent successful device closure with an ASO at single tertiary referral cardiac center in India.. This was out of an attempted 543 cases. The procedure was carried out in catheterization laboratory under transesophageal echocardiographic and fluoroscopy guidance. The mean size of ASD was 20 mm (7-40 mm) while size of septal occluder was 10-40 mm (mean 24 mm). Two devices were deployed in four patients. Three patients developed transitory pulmonary edema in immediate postprocedure period requiring ICU care for 48 hrs. All patients were advised for Aspirin (3-5 mg/kg, maximum 150 mg) once daily for 6 months. In patients with device 30 mm or larger, Clopidogril ( 75 mg once daily) was given for 3 months in addition to Aspirin. Clinical evaluation, echocardiogram were done on 3 months, 6 months and then at 1, 3, 5, 7 and 10 years of follow up. Transesophageal echocardiography (TEE) was performed in case of any doubt on clinical evaluation or on transthoracic echocardiography (n=10). Results : Followup data is available for 496 patients (93.7%). Followup period is from 12 months to 120 months (median 56 months). On followup, device was in position in all patients, no residual shunt and no evidence of thrombosis. Interventricular septal motion normalized on day of procedure in 89% patients, in 6% over 3 months while flat septal motion persisted in 5% (n=25, all in age group > 40 years) of cases, though right ventricular dilatation persisted in 10% (n=50, age more than 40 years) of patients. Symptom-free survival was 96.7 % (480/496) in patients who came for followup. Only one 68 year old patient with preexistent tricuspid regurgitation developed congestive heart failure, and one patient (58 years old) had a history of hemiparesis after 1 year of device on telephonic interview. Ten patients were in atrial fibrillation (AF) before the procedure and remained in AF on followup. Conclusions : Our study showed that percutaneous closure of fossa ovalis ASD is a safe and effective procedure on intermediate and long-term followup in both the children as well as adults.both. Technical factors during the procedure and proper follow up are important. Our single centre intermediate and long term experience in a large number of patients support the use of device closure as an alternative to surgery. We are reporting intermediate to long-term follow up data from a single tertiary cardiac center in India in a large number of patients. Medical records including clinical, chest X-Ray, electrocardiography, echocardiography, cardiac catheterization and followup data of all patients who underwent attempted percutaneous device closure (ASD) were reviewed. Consent for reviewing the records of patients was obtained from the ethical committee of the institute. From May 1998 to July 2008, device closure of fossa ovalis ASD using Amplatzer septal occluder (ASO) was attempted in 543 patients and procedure was successful in 529 (97.4%) [Figure 1]. The reasons for failure (n=14) include deficient various rim(s) (n=6), unacceptable interatrial septum length in relation to balloon size of ASD (n=4), while in four patients device embolized in immediate post-procedure period. All four patients with device embolization were taken for surgery for ASD closure and device retrieval. On retrospective analysis,the causes for embolization were very large ASD (38 mm) with deficient aortic rim in one, larger ASD than measured on TEE in another, torn atrial septum during device closure attempts in third, and in one case. The device was inadvertently released in the right atrium and could not be snared. 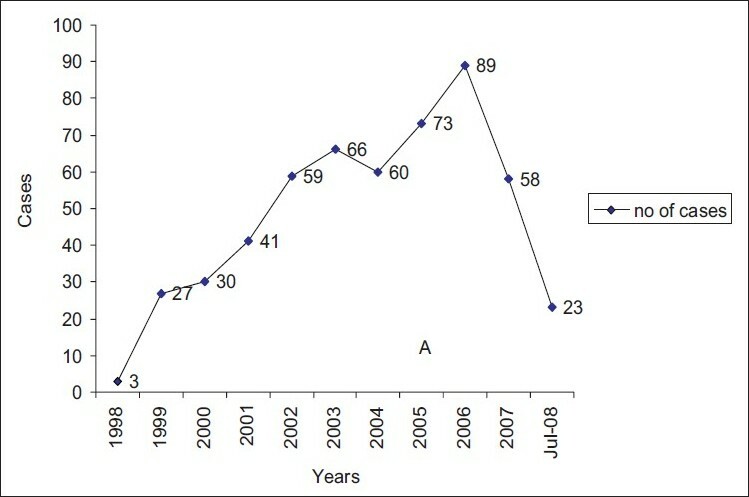 Followup data of all 529 patients who underwent successful device closure was analyzed till July 2009. Total 496 patients (93.7%) came for followup. Mean age of patients was 28 (2-77) years and weight 52 kg (9.6-128 kg), female:male ratio was 1.34:1. Majority of patients were asymptomatic at presentation. In age group <10 years, 14% (20/136) children had history of poor weight gain (mean weight 10 th percentile), though there was no limitation of functional capacity. However, some patients of > 40 years of age were symptomatic. . The main presenting feature in this age group was early fatiguability (NYHA class II) in 30% (30/102) and palpitations 22% (21/102). In the rest, it was accidental detection of murmur or cardiomegaly on chest X-Ray for which echocardiography was advised. A physical examination, a standard 12-lead electrocardiogram (ECG), chest radiograph and transthoracic echocardiography (TTE) were performed in all patients. In patients with poor echocardiographic windows (adolescents and adults), TEE was also done for detailed definition of the defect. Written informed consent was taken from parents or patient before the procedure. The initial assessment of the size of ASD by TTE in all patients. In almost all adolescents/ adults a TEE was performed to assess size of defect and margins. The only exception to this rule was those patients in whom a central defect was seen on TTE. Even in these patients a TEE was performed in the cardiac catheterization laboratory prior to venous access. Coronary angiogram was performed in all patients beyond 40 years of age and in those with suspected history of coronary artery disease before this age. If there was evidence of coronary artery disease opinion was sought from the adult team before proceeding for the device closure. A complete right heart study for right-sided pressures and shunt was performed in all. The procedure was done in catheterization laboratory under general anesthesia with TEE and fluoroscopy guidance. The protocol for device implantation is same as described in literature. , In period prior to November 2003, our institute policy was to use balloon stretch diameter (Equalizer TM Occlusion Balloon Catheter, Boston Scientific) for selecting the device size. With this technique, ASD size and device size ratio was 1.5-1.7. Since December 2003 till 2006, we were taking balloon occlusion diameter (Amplatzer sizing balloon) to select the device and ASD size and device ratio was 1.2:1.4. Since 2007, our policy is to take device 2 mm larger than defect if all the rims are adequate or 2-4 mm larger than defect if 1 or more rim(s) is deficient. The ASD size and device ratio remained between 1.2 and 1.4 with this policy. The mean diameter of ASD was 20 mm (range 7-40 mm) and required device sized 24 (range 10-40mm) [[Figure 2]a-b]. Postdevice deployment there was minimal flow through the device fabrics in all patients, no abnormality in flow across pulmonary vein(s), superior and inferior vena cava and atrioventricular (AV) valves. Fifty-four patients were having multiple defects, in four additional defect(s) was large or in different plane requiring use of two devices to occlude the defects. Rest 50 patients had tiny or small defect adjacent to the main defect and complete closure was achieved in all except one. Combined procedure: Combined procedure was done in eight patients, balloon pulmonary valvotomy (n=4), PDA device closure (n=2), PDA coil closure (n=1) and balloon mitral valvotomy (n=1). Additional procedure was successful in all. Major complications were encountered in five patients. Three patients (aged 18, 35 and 52 years) developed pulmonary edema after device deployment requiring positive pressure ventilation for 24 hrs along with intravenous diuretics. One 35 years old lady had LV diastolic dysfunction on echocardiography on preprocedural evaluation and device closure was attempted after balloon occlusion test. In cath lab, baseline LVED pressure was 16 mmHg which increased to 18 mmHg on balloon occlusion. wAfter device deployment LVED pressure was 18 mmHg .Despite adequate perioperative precaution (intravenous frusemide and elective extubation after 1 hour) ,she developed pulmonary edema requiring ventilation support for next 24 hrs. Diastolic dysfunction was found on tissue Doppler examination after the event. Now we give intravenous diuretics after device deployment and delay the extubation (8-12 hours) in all patients who are hypertensive or over 40 years. In one patient, left atrial appendage (LAA) was perforated during catheter manipulation. Pericardial effusion was noted immediately after device deployment and she was managed with pericardial drainage, autotransfusion and was taken for emergency surgery. Operative findings showed perforation in LAA which was sutured. In one patient (4 years, 12 kg), there was loss of femoral pulse on the side of venous sheath. Doppler study showed wall edema. She was given intravenous heparin infusion for 5 days till pulses restored. Electrocardiographic abnormalities: Electrocardiographic changes during the procedure or within 24 hours of device deployment were seen in 55 patients (10.3 %). ST segment elevation was the commonest ECG change, seen in 24 patients which was transient in all except one in whom there was significant fall in blood pressure requiring intravenous fluid administration though on echocardiography there was no wall motion abnormality. In rest 31 patients, there was rhythm abnormalities including supraventricular tachycardia (SVT) (n=22), atrial fibrillation (AF) (n=4), junctional rhythm (n=4) and wandering pacemaker(n=1). For SVT, long-term treatment (1-3 years) (metaprolol n=1,amiodarone n=6) was required in 7 patients. In two patients AF was transient, while in rest two it was persistent requiring antiarrhythmic treatment (Amiodarone). Patients with junctional rhythm and wandering pacemaker did not require any treatment. ECG, chest X-ray (Deep penetrating, frontal and lateral views) and TTE were performed at 24 hours. On TTE, device position, stability, any evidence of encroachment over AV valves, pulmonary veins, and vena cava was looked for. Patients were discharged on Aspirin 5 mg/kg (max 150 mg) for 6 months and in case of large device (> 30mm) or double device Clopidogrel (300 mg stat, 75 mg once daily) was given in addition to Aspirin for 3 months. Bacterial endocarditis prophylaxis was advised for 6 months postprocedure. Thereafter, followup was done at 3 months,1 year and then annual with clinical evaluation, ECG (if there is rhythm abnormality) and TTE. TEE was done if there is any doubt on TTE. Additional visit at 1 month was advised where device is larger >30 mm or when two devices were deployed. Followup data is available for 496 (93.7%) patients [Figure 3], period 12 months -120 months (median 56 months). Of these 496 patients, 10 patients did not come for followup but were evaluated at local center and details were available on phone/fax. Clinically all patients were in NYHA class 1 except two. This 68-year-old lady with fossa ovalis ASD (18 mm), left to right and moderate tricuspid regurgitation underwent device closure (24 mm) after balloon occlusion test to look for any rise in right atrial pressure. She was discharged on diuretics and was stable on 1 month followup. On 3 months followup she was in right-sided failure with respiratory distress, hepatomegaly and pedal edema. She was stabilized after increasing the dose of diuretics. Twenty patients developed headache after device deployment, nine were having pre-existing migraine while in 11 patients headache developed de novo. On followup headache was not persistent and also there was no further worsening of migraine episodes. A 58-year-old female patient (ASD 17 mm, device 24 mm) developed hemiparesis 1 year after the procedure. At the time of discharge she was in normal sinus rhythm and was discharged on asprin. As she did not come for followup, she was contacted telephonically. No cardiology or neurologic evaluation was done to look for the cause of hemiparesis. Fourteen patients who were discharged with arrhythmia (tachy or brady), remained stable. With tachyarrhythmia who were discharged on antiarrhythmic medication (n=9), there was recurrence of SVT in two patients and were stabilized with increasing dose of medication. Patients with junctional rhythm (n=4) and wandering pacemaker (n=1) did not require any treatment and recovered over 2-6 weeks. Two patients develop atrial flutter 1-4 weeks after device deployment and were controlled with medication (Amiodarone). Ten patients (age group >50 years) were in AF before the procedure. They were discharged on oral antiarrhythmic (Amiodarone) but remained in AF with controlled ventricular rate. TTE was done in all patients on followup. Device was in situ with no residual flow in all except one with small residual flow. Ventricular function was normal on followup. Interventricular septal motion normalized on same day of procedure in 89% patients, in 6 % over 3 months while flat septal motion persisted in 5% (n=25) of cases. Right ventricular end-diastolic dimension normalized over 3-6 months period in 90% cases while RV dilatation persisted in rest 10%. Right ventricular dilatation and flat septal motion persisted in age group more than 40 years. There was no evidence of new appearance of valve leak (mitral, tricuspid or aortic), cardiac perforation and erosion of aorta by device, device embolization or device distortion/fracture. Since the launch of transcatheter closure of septal defects, there have been many devices introduced over the period. ASO is the commonest occluder used for closure of septal defects with excellent results and very low risk of complication. All patients were symptomatically better except one described above. Three patients, who developed pulmonary edema after device closure requiring ventilator support and diuretics therapy, were discharged on oral diuretics (Frusemide and Aldactone). All three were having LV diastolic dysfunction on echocardiography after device closure. LV diastolic dysfunction normalized over 3-6 months period time and diuretics were stopped. Arrhythmias were reported during the procedure and in immediate postprocedure period in various reports. ,, We have also seen ECG changes (ST elevation and arrhythmias) during procedure. ST elevation was transient and all patients were stable on followup. Nine patients developed arrhythmia after device deployment while two patients developed SVT on 1-4 weeks after device deployment. Both theses were having history of palpitation before device deployment. Various reports show effectiveness of device closure with excellent immediate, short and long-term closure rates. ,,,,, This study also showed complete closure (excluding flow through device fabrics) in 97% of patient on next day and complete closure in rest by 3 months except in one patient. On followup a large profile of device obtained immediately after deployment decreases significantly at 3 months followup. Thrombus formation on the device, particularly on ASO, is a rare event. , Neither thrombus nor systemic thromboembolism were detected in our study immediately and on followup; however, we have not done TEE in all cases on followup. Device embolization or malposition is a well-known complication during the procedure which is an avoidable issue by careful evaluation of anatomy and selection of device while late embolization have also been reported. ,, We have not experienced any case of delayed device malposition or embolization. Cardiac perforation is a rare but serious life-threatening complication after device closure. First case reported by Amin et al,  erosion or perforation was identified by the late development of pericardial effusion. Pooled data showed an incidence of 0.1% for device erosion with the ASO. Reports suggeststhat aortic rim in isolation should not be considered as a contraindication for device closure. One needs to oversize the device (2-4 mm) with deficient aortic rim to straddle the device over the aorta. We have not experienced any case of cardiac perforation after device closure on followup even in patients with deficient aortic rim. Study by Sigler et al,  showed that endothelialization process completes in 3 months and so bacterial endocarditis prophylaxis is advised for 3-6 months by various authors. Infective endocarditis was reported in a patient after 2 months of device closure. We have not experienced any case of infective endocarditis in our series of patients. Excellent results have been reported even in multiple defects in children and adults. ,, Recently analysis of the Food and Drug Administration Manufacturer and User Facility Device Experience database  for adverse events involving Amplatzer septal occluder devices and comparison with the Society of Thoracic Surgery congenital cardiac surgery base was published. Percutaneous device deployment failure has been reported to be between 0-20%.Since July 2002, 223 adverse events in patients undergoing Amplatzer ASD closure were submitted to FDA, which included 17 death and 152 surgical rescue operations. Society of thoracic surgery data reported 1537 primary operation with 2 deaths (0.13%) and 6 reoperation (0.39%). By extrapolating on published estimates of Amplatzer implantation to provide an implant denominator (n=18,333), there was no difference between overall mortality for surgical (0.13%) and device closure (0.093%) (p=0.649). Our data shows immediate success rate of 97.4% and need of surgery as rescue in 0.9% patients (5 patients, device embolization in 4 and LAA perforation in 1patient) during ASD device closure. On follow up we did not encounter any major complication. There is no procedure related, early or late mortality in our series. Followup was not 100% complete but considering the fact that this study is from a single institution from a tertiary center with patients being referred from different parts of the country where communications and travel are very difficult for many patients, 93.7% followup is a very good figure. Assessment of residual shunt and clots on the device was done by TTE for logistic reasons, and TEE was restricted to only those patients where the information from TTE was considered inadequate. It is possible that these complications might have been underestimated. However, The literature on residual shunts reported on the ASO is, however, commensurate with our data. We have not performed any objective tests to assess clinical improvement after device closure and "clinical improvement" in symptoms reported by patients was based purely on direct questioning. However, the majority of our patients were asymptomatic at presentation underscoring the difficulties in objectively documenting further improvement in symptoms status after device closure. This study in a cohort of large number of patients shows that percutaneous closure of fossa ovalis ASD is a safe and effective procedure on a followup period of up to 10 years. 1. Masura J, Gavora P, Podnar T. Long-term outcome of transcatheter secundum-type atrial septal closure using Amplatzer septal occluder. JACC 2005;45:505-7. 2. Elshershari H, Cao QL, Hijazi ZM. Transcatheter device closure of atrial septal defects in patients older than 60 years of age: Immediate and follow-up results. J Invasive Cardiol 2008;20:173-6. 3. Rossi RI, Cardoso Cde O, Machado PR, Francois LG, Horowitz ES, Sarmento-Leite R. Transcatheter closure of atrial septal defect with Amplatzer device in children aged less than 10 years old: Immediate and late follow-up. Catheter Cardiovasc Interv 2008;71:231-6. 4. Spies C, Timmermanns I, Schräder R. Transcatheter closure of secundum atrial septal defects in adults with the Amplatzer septal occluder: intermediate and long-term results. Clin Res Cardiol 2007;96:340-6. 5. Patel A, Lopez K, Banerjee A, Joseph A, Cao QL, Hijazi ZM. Transcatheter closure of atrial septal defects in adults > or =40 years of age: Immediate and follow-up results. 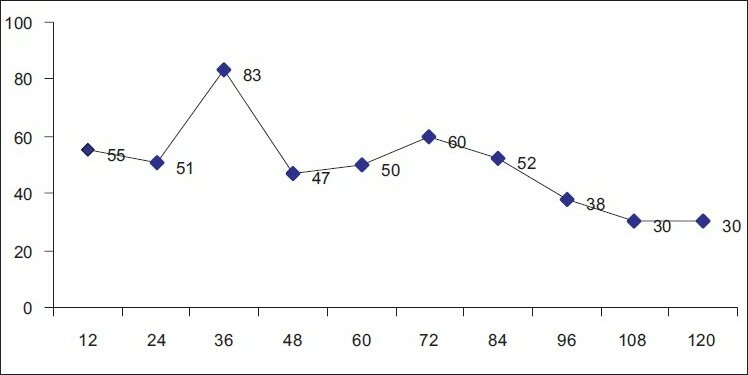 J Interv Cardiol 2007;20:82-8. 6. Yew G, Wilson NJ. Transcatheter atrial septal defect closure with the Amplatzer septal occluder: Five-year follow-up. Catheter Cardiovasc Interv 2005;64:193-6. 7. Wang JK, Tsai SK, Wu MH, Lin MT, Lue HC. Short- and intermediate-term results of transcatheter closure of atrial septal defect with the Amplatzer Septal Occluder. Am Heart J 2004;148:511-7. 8. Masura J, Gavora P, Formanck A, Hijazi ZM. Transcatheter closure of secundum atrial septal defects using the new self-centering amplatzer septal occluder: Initial human experience. Cathet Cardiovasc Diagn 1997;42:388-93. 9. Sharafuddin MJ, Gu X, Titus JL, Urness M, Cervera-Ceballos JJ, Amplatz K. Transvenous closure of secundum atrial septal defects: Preliminary results with a new self-expanding nitinol prosthesis in a swine model. Circulation 1997;95:2162-8. 10. Tomar M, Radhakrishnan S, Shrivastava S. Transcatheter closure of fossa ovalis atrial septal defect: A single institutional experience. Indian Heart J 2006;58:325 -9. 11. Mishra S, Tomar M, Radhakrishnan S, Mishra Y, Shrivastava S, Trehan N. Comparison Between Transcatheter Closure and Minimally Invasive Surgery For Fossa Ovalis Atrial Septal Defect: A Single Institutional. Indian Heart J 2008;60:125-32. 12. Fischer G, Stitch J, Ucbing A, Hoffmann U, Morf G, Kramer HH. Experience with transcather closure of secundum atrial septal defects using the Amplatzer septal occluder: A single centre study in 236 consequtive patients. Heart 2003;89:199-204. 13. Du ZD, Cao QL, Rhodes J, Heitschmidt M, Hijazi ZM. Choice of device size and results of transcatheter closure of atrial septal defect using the Amplatzer septal occluder. J Interv Cardiol 2002;15:287-92. 14. King TD, Thompson SL, Steiner C, Mills NL. Secundum atrial septal defect. Nonoperative closure during cardiac catheterization. JAMA 1976;235:1645-50. 15. Smith BG, Wilson N, Richens T, Knight WB. Midterm follow-up of percutaneous closure of secundum atrial septal defect with Helex Septal Occluder. J Interv Cardiol 2008;21:363-8. 16. Huang TC, Hsieh KS, Lin CC, Lee CL. Clinical results of percutaneous closure of large secundum atrial septal defects in children using the Amplatzer septal occluder. Heart Vessels 2008;23:187-92. 17. Diab KA, Cao QL, Bacha EA, Hijazi ZM. Device closure of atrial septal defects with the Amplatzer septal occluder: Safety and outcome in infants. J Thorac Cardiovasc Surg 2007;134:960-6. 18. Chessa M, Carminati M, Butera G, Bini RM, Drago M, Rosti L, et al. Early and late complications associated with transcatheter pcclusion of secundum atrial septal defect. J Am Coll Cardiol 2002;39:1061-5. 19. Hill SL, Berul CI, Patel HT, Rhodes J, Supran SE, Cao QL, et al. Early ECG abnormalities associated with transcatheter septal occluder. J Interv Card Electrophysiol 2000;4:469-74. 20. Krumsdorf U, Ostermayer S, Billinger K, Trepels T, Zadan E, Horvath K, et al. Incidence and clinical course of thrombus formation on atrial septal defect and patent foramen ovale devices in 1,000 consecutive patients. J Am Coll Cardiol 2004;43:302-9. 21. Anzai H, Child J, Natterson B, Krivokapich J, Fishbein MC, Chan VK, et al. Incidence of thrombus formation on the CardioSEAL and the Amplatzer interatrial closure devices. Am J Cardiol 2004;93:426-31. 22. Verma PK, Thingnam SK, Sharma A, Taneja JS, Grover A. Delayed embolisation of Amplatzer septal occluder device: An unknown entity. A case report. Angiology 2003;54:115-8. 23. Amin Z, Hijazi ZM, Bass JL, Cheatham JP, Hellenbrand WE, Kleinman CS. Erosion of Amplatzer Septal occluder device after closure of secundum atrial septal defect: Review of registry of complication and recommendation to minimize future risk. Catheter Cardiovasc Interv 2004;63:496-502. 24. Sigler M, Jux C. Biocompatibility of septal defect closure devices. Heart 2007;93:444-9. 25. Bullock AM, Mcnahem S, Wilkinson JL. Infective endocarditis on an occluder closing an atrial septal defect. Cardiol Young 1999;9:65-7. 26. Berger F, Ewert P, Björnstad PG, Dähnert I, Krings G, Brilla-Austenat I, et al. Transcatheter closure as standard treatment for most interatrial defects: Experience in 200 patients treated with Amplatzer Septal Occluder. Cardiol Young 1999;9:468-73. 27. Bramlet MT, Hoyer MH. Single pediatric center experience with multiple device implantation for complex secundum atrial septal defects. Catheter Cardiovasc Interv 2008;72:531-7. 28. Mahadevan VS, Gomperts N, Haberer K, Silversides C, Benson LN, McLaughlin PR, et al. Transcatheter closure of atrial septal defects with multiple devices in adults: Procedural and clinical outcomes. Int J Cardiol 2009;133:359-63. 29. DiBardino DJ,McElhinney DB,Kaza AK,Mayer JE.Analysis of the US Food and Drug Administration Manufacturer and User Facility Devices Experience database for adverse events involving Amplatzer septal occluder devices and comparison with the Society of Thoracic Surgery congenital cardiac surgery database. J Thorac Cardiovasc Surg 2009;137:1334-41. Pan, X.-B., Pang, K.-J., Hu, S.-S., (...), Ge, Y., Li, S.-J. MacDonald, S.T., Daniels, M.J., Ormerod, O.J. Albers, E., Janssen, D., Ammons, D., Doyle, T.
Kojuri, J., Ostovan, M.A., Rezaee, M.
Guo, J.-J., Luo, Y.-K., Chen, Z.-Y., Cao, H., Yan, X.-P., Chen, H., Peng, Y.-F., (...), Chen, L.-L.